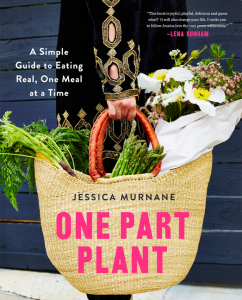 Jessica Murnane’s “One Part Plant” (OPP) is like the girlfriend’s guide to eating more veggies. Her approachable tone invites you into the kitchen one vegetarian meal at a time and layouts out the framework of what you need to get there. 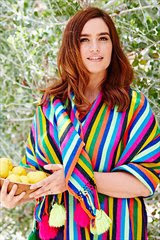 Jessica touts only the benefits without forcefulness or coercion as she walks you through the potentially unfamiliar territory of shopping vegetarian and cooking with anti-inflammatory foods. Driven to a healthier diet as a solution to her crippling endometriosis condition, she found relief and recovery in the friends of plants and anti-inflammatory foods. One Part Plant recipes cover the complete meal spectrum in an attainable way. Presenting classic dishes with elevated approaches to innovative meals, all recipes remain simple in ingredients and execution. Jessica leaves flexibility in the amount of salt and acid in her recipes, and reinforces the idea of cooking to your own tastes, which I highly appreciate. Perhaps realizing the comfort limits of her audience, she refrains from labeling her recipes vegan, though most of were, describing them only as plant-based and allergy-friendly, eliminating any potential audience intimidation by the term ‘vegan’ – smart. Due to Jessica’s endometriosis, she cooks with anti-inflammatory and easy to digest foods, limiting dairy and eggs. One frequently used ingredient you’ll see in One Part Plant as a replacement for them are raw, soaked cashews. Though cashews are a wonderful substitute, I can’t say I’m willing to use them since I already have dairy and eggs in my house and am not interested at this point in buying and soaking them. Listing a traditional ingredient substitute, like eggs or sour cream depending on the recipe, would be helpful for the unfamiliar chef since swapping out cashews isn’t as straightforward as flours or bread. However, seeing as Jessica couldn’t eat it to test those substitutions, I understand why they weren’t specifically included. From that list, I made the hummus, carrot salad and chowder. Loving all things buffalo, with sauce in my fridge and the four other ingredients (white beans, tahini, lemon, and maple syrup) in my kitchen, trying out this flavor fusion was surprisingly simple. Simplicity was a champion in this recipe, as this take on hummus was beyond satisfying. With a dishwasher on the fritz, and easy clean-up on the mind, I pureed the hummus in my Vita-mix resulting in a velvety texture and added a splash more buffalo than specified due to my ridiculously high spice tolerance after years of capsaicin abuse. 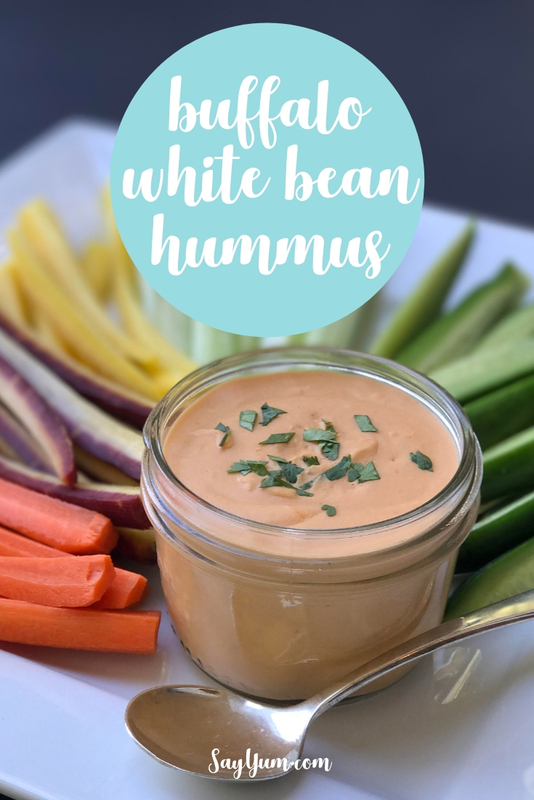 The hint of nuttiness and slightly bitter notes from the tahini complemented the buffalo flavors seamlessly. Garnished with chopped cilantro, it paired perfectly alongside of buffalo worthy vegetables like carrots, celery and cucumber for a refreshing twist. The hummus accentuated the veggies fresh flavors and elevated buffalo from Hooters and made it worthy of the trendiest gastropub around. Recipe at end of post. With low expectations, due to the familiar list of ingredients, I didn’t expect to be rewarded with the bright, and satisfying blend of flavors that arose from this deceptively simple salad. The easy to shop for aspect was a great benefit of this dish. Out of its nine ingredients only two were required shopping, pistachios and coconut milk. The coconut milk stayed in the background, balancing and cooling the lime juice and cider vinegar. Candied pistachios gave the salad pops of crunch with their sweet and salty combination. Using mint and dill united the whole dish providing harmonious, herbal notes. It was so good there was nothing left at the end of dinner. Requiring only six ingredients, not including oil or salt and pepper, this soup makes a comforting option for warming the soul on a chilly winter’s night. The only unusual ingredient was coconut milk, but the carrot salad only required a small amount, so there was more than enough left over for the soup. Tasting the roasted potatoes, reminded me of their simple pleasure, crunchy nuggets exploding with luxuriously, creamy insides brought to life by perfect seasoning. They were so good I didn’t want to puree them. The leek, corn and garlic mixture played together well. Though I wish I opted for roasting the corn first to bring out its sweetness since it was frozen, or purchased the bag of fire-roasted as a shortcut. If it was corn season, fresh corn would be the obvious choice, but likely wouldn’t make this in the summer. The only frustration was the coconut milk took over the delicate veggie flavors but did make the richest, creamiest non-dairy broth in my experience. I’ll definitely use it when entertaining our next vegan guest to make a perfectly, satisfying cream soup, just less of it. I’m confident this soup is a winner and will cut the coconut milk next time to find the right balance for my tastes between the gentle flavors of potato, leek and corn. After only three recipes, I’m still eager to make my way through the rest of my list, and beyond. Her approach to eating is very similar to mine in several ways and therefore resonates strongly. She never tells you what to eat, but encourages you to experiment and make choices based on how your body responds, recognizing the individuality of our body’s digestion. The whole OPP philosophy is based on small changes, one plant based meal at a time. Finally, Jessica gives us permission to be imperfect stressing the relief that comes when you realize if today’s choices weren’t the best, there’s always tomorrow, and the next and the next. Jessica don’t force or encourage you to abolish every bite of food that makes you happy, but instead to explore your curiosity, grocery store and culinary skills one meal at a time. The photographs make you feel like you’re eating at Jessica’s house, or at least how I imagine it to be: colorful, casual with a sense of whimsy. Their bold colors and striking composition make you want to dive into the recipe immediately. The photos capture the rustic nature of the dishes beautifully making each dish an invitation to try. What appeals to me the most is her guidance for the vegetarian curious cook. She addresses potential barriers that unfamiliar cooks might have with foreign ingredients. 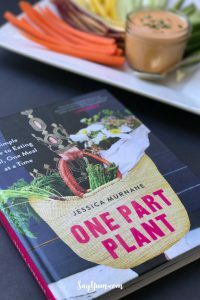 Guiding the reader from beginning to end, Jessica lists her kitchen tool essentials, top pantry picks, how they taste, potential health benefits, what they are replacing in more traditional fare, versatility in the kitchen and where to find them in the grocery store. Her helpful FAQ answers many questions I hear nutritionally inquisitive minds ask and includes a question about the possibility of feeding your family a plant-based diet. No doubt she responds positively and cites the potential to embark on the journey with some gateway recipes identified in some of the book’s recipe introductions. For ease of locating, a list of those recipes in the response would have been helpful as a reference. Overall the guide portion of the book embraces the reader, holding their hand through unfamiliar territory. This review is part of Jessica’s book tour with TLC Book Tours. Hummus gets a spicy twist! 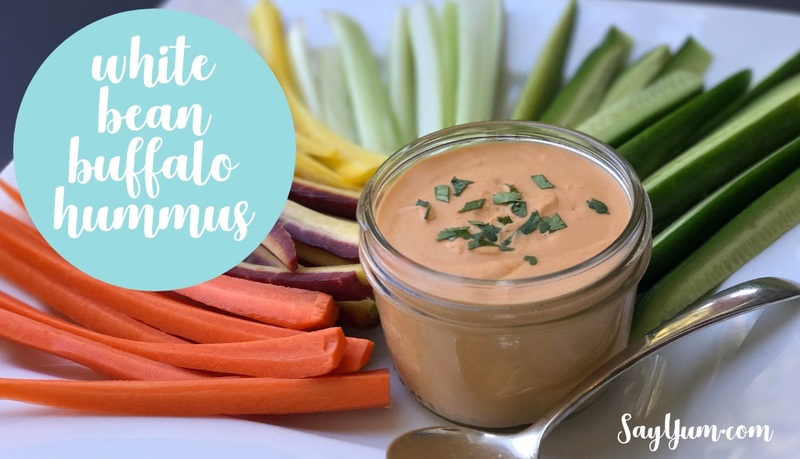 Swapping in white beans for garbonzos and adding buffalo gives traditional hummus a welcome update. Delicious for any party platter or snacking any time. In a food processor with the S blade attached, pulse the bean, tahini, 2 T buffalo sauce, maple syrup, 2 T of lemon juice, and a pinch of salt to a smooth pasted. Add more salt and lemon juice if needed and more buffalo sauce to get it to the spice level you love. Store the hummus covered in the fridge for a week. 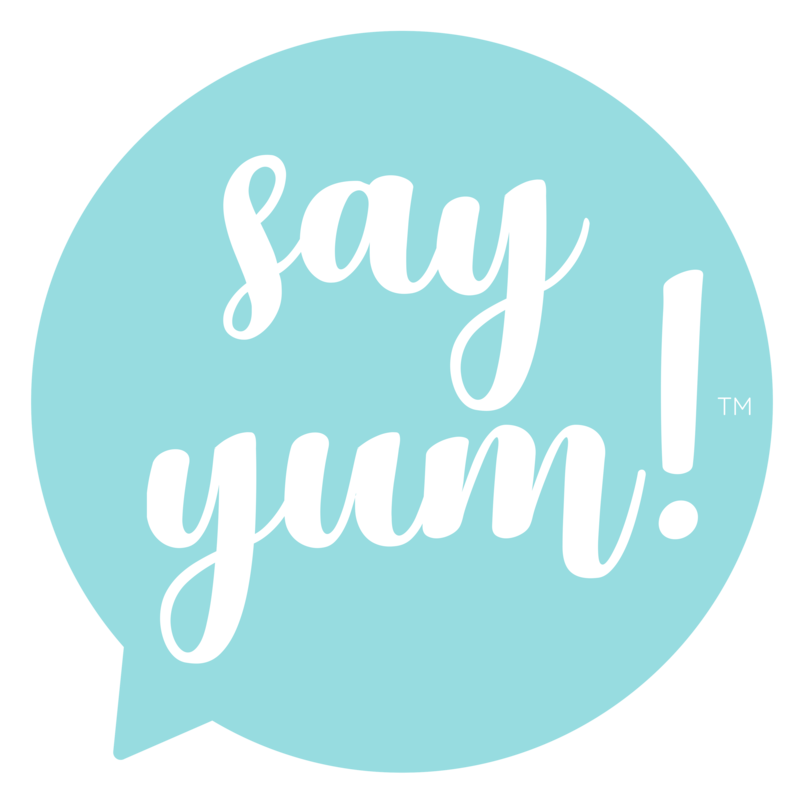 Notes from say yum! You can use a Vitamix to make this too. Be sure to add the liquid ingredients first to make blending easier. It's a little tough to get out of the container, but manageable and easier to clean. I also added more like 4T of buffalo sauce because I'm crazy like that. Legal Stuff | Disclaimer: I voluntarily posted this review and received no other compensation, other than a copy of this book from TLC Book Tours. Thank you. All opinions are my own, and honest.